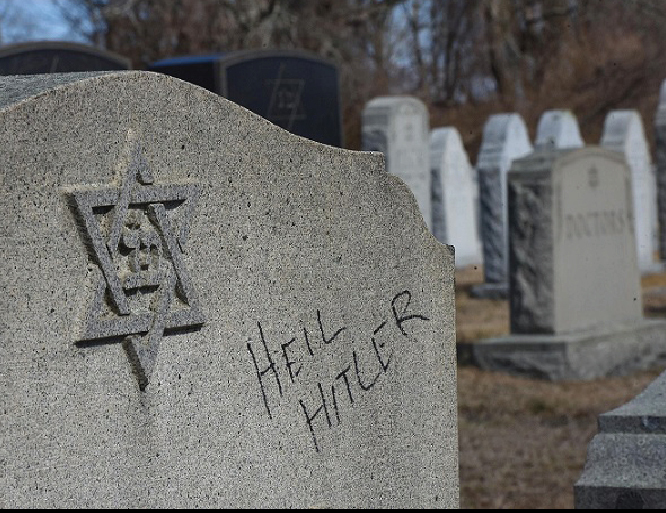 FALL RIVER – A Muslim charity group in the US has raised $5,000 to help a Jewish cemetery in Massachusetts which was vandalized last week, Forward.com reported. “I received an outpouring of support from around the world. In particular, I received an envelope in the mail from Muslim Americans nationwide to our Jewish cousins of the Hebrew Cemetery of Fall River. Inside the envelope: A check for $5,000,” the cemetery groundskeeper and president of Congregation Adas Israel, Jeffrey Weissman, recounted. According to the police investigations in Massachusetts, the identities of those responsible, as well as the number of those involved, are still unknown. A reward has been offered to anyone with information regarding the identity of those involved in the recent vandalism. As of Monday, March 25, Weissman said that reward had reached $16,000, though he expects it to climb as high as $20,000. Also, a community cleanup of the cemetery had been planned but has since been scrapped out of concern that too many volunteers might lead to further damage. In fact, this isn’t the first donation of its kind for ‘Celebrate Mercy’ group which has over the past two years given $115,000 to vandalized Jewish cemeteries and memorials in Missouri, Illinois, New York, Massachusetts, and Colorado. Moreover, the Muslim group has also facilitated the donation of around $238,000 to the Tree of Life*Or L’Simcha Congregation in Pittsburgh after the 2018 massacre there. “In the spirit of responding to evil with good as taught by the Prophet Muhammad (PBUH) that inspired the previous campaign, Celebrate Mercy is proud to have supported this community in their time of distress,” the organization wrote on its Facebook page. According to Weissman, a majority of the donations that have been made will be used to pay for a new security system for the cemetery to prevent future incidents. Islam is the third largest religion in the US after Christianity and Judaism. According to a 2017 study, it’s followed by 1.1% of the population, compared with 70.6% who follow Christianity and 1.9% who adhere to Judaism.